Sweet, fruity, and tangy, this carrot side dish is a perfect complement to savory, hearty dishes. Sliced carrots are cooked in hard cider (look for one with an apple note) for about 30 minutes (carrots take a while to get tender). Toward the end of cooking, the cider is evaporated and the carrots are left plump and juicy. Next, saute them in olive oil which adds a slight richness and browns the edges. 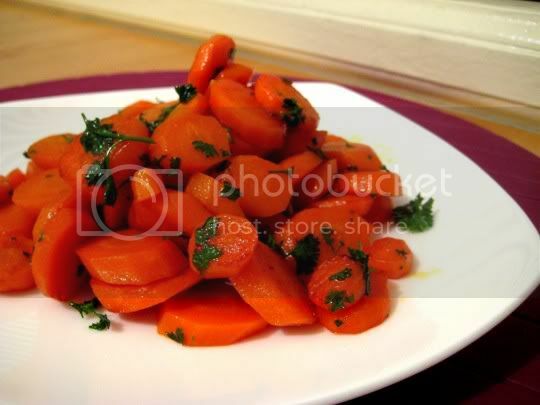 Chopped parsely is added at the end of cooking and gives the carrots an interesting herbal flavor, and I'd say adding the parsley is probably optional. Chopped fresh sage might actually be a better choice here, or maybe even thyme. But that's it, those four simple ingredients. It's really the cider that is the star in this dish, and it's amazing how juicy and sweet it makes the carrots. In the end, you've got a delicious and quick healthy dish that anyone should love. Make again? Yes, another good side dish for the holiday table.